Pierrot Co., Ltd. (株式会社ぴえろ, Kabushiki-gaisha Piero) is a Japanese animation studio, founded in 1979 by former employees of Tatsunoko Production and Mushi Production. 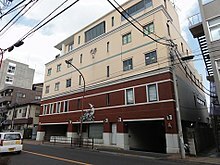 Its headquarters is located in Mitaka, Tokyo. Pierrot is renowned for several worldwide popular anime series, such as Bleach, Naruto, Yu Yu Hakusho, Tokyo Ghoul, Beelzebub, Great Teacher Onizuka and several others. The company has a logo of the face of a clown. "Piero" is a Japanese loanword for clown, adopted from the classical character of Pierrot. Yu Yu Hakusho and Saiyuki, two of the company's anime series, won the Animage Anime Grand Prix Award in 1994 and 1995, and 2000, respectively. ^ "Company Profile." Pierrot Co., Ltd. Retrieved on 29 April 2013. ^ "Animation Production PIERROT". Archived from the original on February 2, 2012. Retrieved 2009-02-11. CS1 maint: BOT: original-url status unknown (link) Retrieved on 29 April 2013. Wikimedia Commons has media related to Pierrot (company).